It’s time to review one of the most popular anime from a year or so ago. 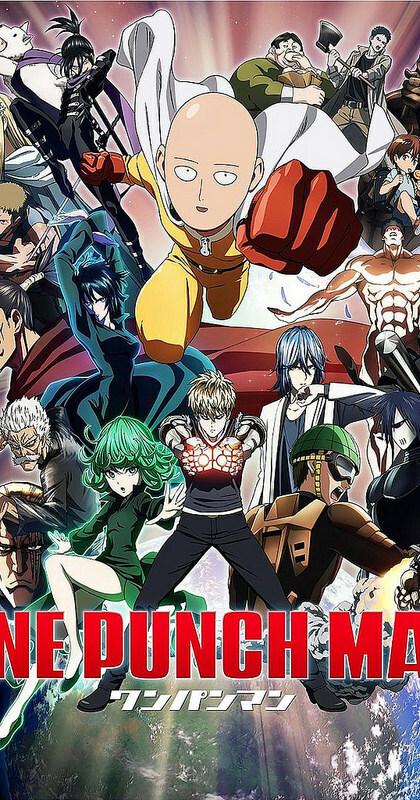 This show was talked about quite a lot and was compared to One Punch Man constantly since both shows came out at around the same time and dealt with superheroes. 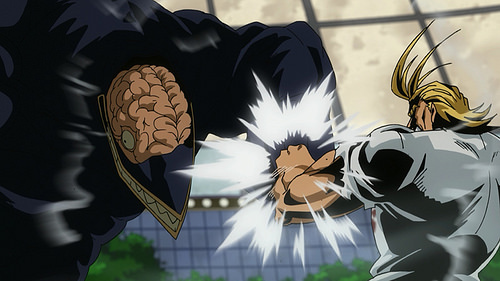 I’m not going to prolong the drama this time though, One Punch Man wins this fight. Both of these titles are great shows, but there is a big gap between incredibly amazing and great. My Hero Academia is a great show, but it’s not stellar to the point where I could easily rewatch the whole show again. One Punch Man has a better cast, universe, animation, soundtrack, fights, potential, and just hype in general. The two shows can’t really be compared as it stands now, but OPM did have a really fast start. 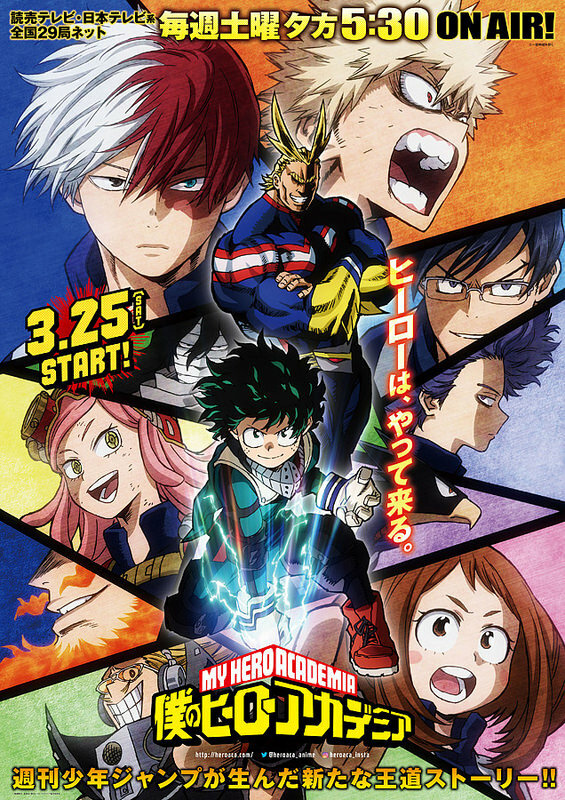 Season 2 will likely not be quite as hype although there are some big scenes coming up while Hero Academia’s season 2 should be leaps and bounds above the first if handled right. Perhaps that is when the comeback will happen so either way, we’ll be comparing both of these when the season 2’s come out. The story follows a kid named Deku. In this planet, almost all people are born with quirks. Typically you’ll gain one that is similar to your parents. 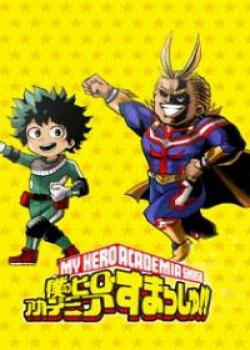 Unfortunately, Deku is one of the few who is quirkless. He has no powers, but Deku has always looked up to superheroes and wants to be one anyway. 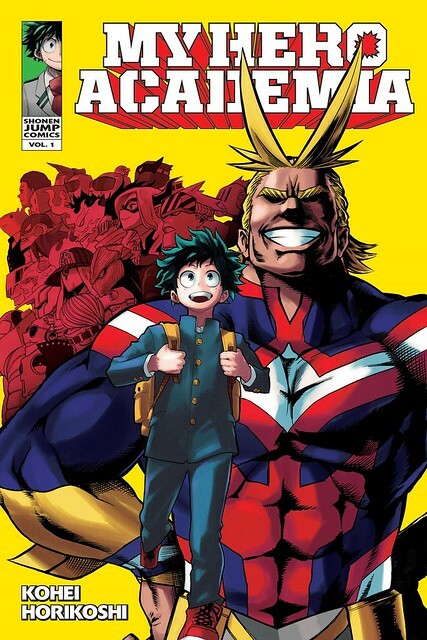 Fortunately, he meets up with All Might, the world’s number one hero. All Might decides to give Deku a portion of his powers. Deku can now join up with the other students at the most prestigious school in the world, but will he be able to keep up with these borrowed powers? He also has to be careful since he is now one of the world’s strongest beings and he could easily destroy one of his classmates by accident if he were to go all out. As this is just season 1, most of the episodes are for world building and character introductions. They do manage to squeeze in one fight with the villain group during the final few episodes though. That is definitely the best part of the season although I also liked the hero vs villain mock battles that occurred a little before that. The only part that gets annoying is Deku’s narration during the episodes where he foreshadows events. It usually ends up just being clickbait and the show doesn’t really need it since the actual content is interesting enough to get you to check in anyway. Of course, I believe that it was in the manga as well, so it’s not as if the show just randomly added it. 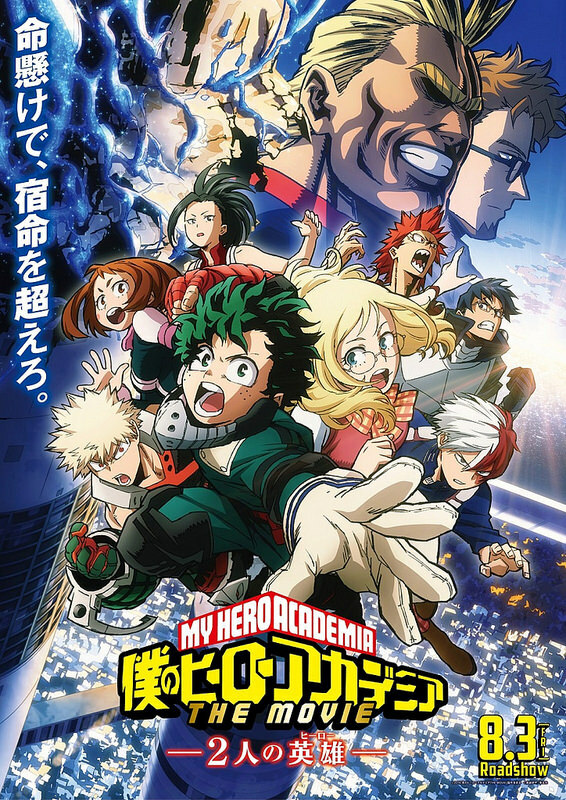 My Hero Academia has a lot of energy and instantly feels like a modern show. All current shows should feel like this and the same thing applies to a video game. If it doesn’t feel new and modern, then something is wrong. My Hero Academia definitely had a pretty good budget. The colors stand out and the characters are streamlined. The show did a good job with this since some of the designs could have easily been a little clunky. Kaachan’s in particular stands out since the design is very convoluted when he’s in his superhero form. That about covers the animation. 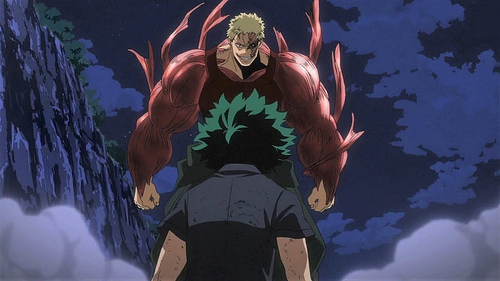 The best animated scenes are typically when Deku is about to throw a huge punch. The energy effect through his arm came out well. Naturally, the soundtrack is also really good. The theme song is still one of my favorites in anime and I listened to it quite a few times. There’s a lot of competition nowadays though so it could easily drop off of the top 10 given time. The villain theme is also very good and brings the hype when the villains make their move. There’s also a decent hero theme and that’s just the tip of the iceberg. It’s a pretty diverse set of themes, but there are only 13 episodes so some don’t get to appear too much. 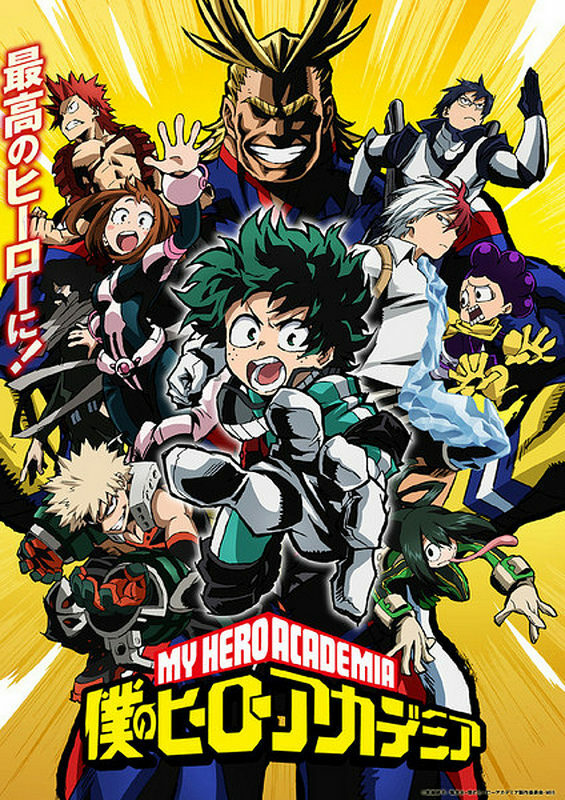 Between the opening, fight themes, and the villain themes, My Hero Academia is definitely set and has a great soundtrack that can hold its own with the best of them. Deku’s a reasonable lead. Standing up to Bakugou near the middle definitely helped his character a lot. If he had been super timid and just run away the whole time, it would have been annoying. 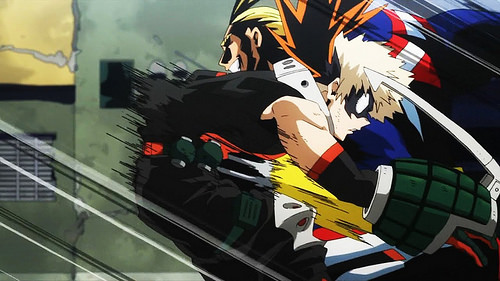 Even if they ultimately decide to make Bakugou nicer so he can be one of the main heroes, at this point he is just a bully. The only way to deal with those is to teach them a lesson and claim the win. The sad part is that Deku could easily beat Bakugou with a single hit, but such a blow could easily kill him so Deku has to try and win with strategy. Deku just kept making the right calls throughout the anime and they were ones that other leads might have hesitated for. 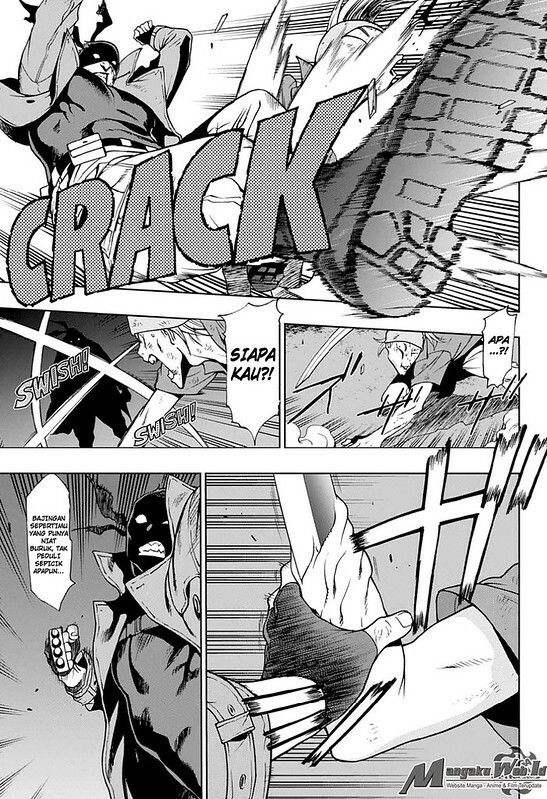 For example, Deku jumped in with a 100% shot at Shigaraki when All Might was cancelled. The attempt didn’t work, but at least Deku was willing to blow his arm off to help. He kept on jumping back into the fray even when the teachers and other kids told him not too. 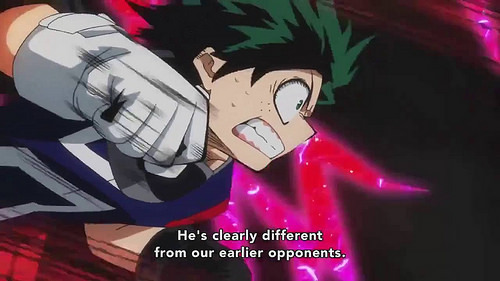 Deku’s definitely one of the bravest guys here and now that he also has more self confidence, I look forward to him continuing to improve in the next season. Having a main character who is extremely powerful and smart without being arrogant is also very unique. There aren’t many characters like that around. 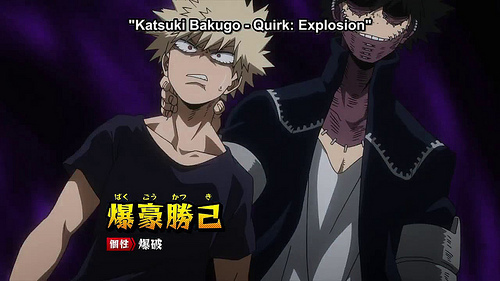 Bakugou is the rival in the show and he’s certainly a little more extreme than some others. He’s not as bad as Gajeel from Fairy Tail since he doesn’t go around crucifying all of Deku’s friends before immediately turning good, but it is still impossible to sympathize with him. He threatens Deku constantly and even burns a notebook that Deku spent years filling up with data. He’s never remorseful about this either and still has the gall to be upset at Deku for actually defending himself. This plot line will continue for a while and the whole time it’s just hard to even remotely see Bakugou’s side of the story. He’s a solid character when he’s not around Deku though and he does help out a lot in the final battles. He’s one of the few characters with a combat quirk so he really needs to put it to good use. Bakugou’s a good character as an antagonist, but if he’s meant to be more like Sasuke from pre Shippuden or Mika from Seraph in the sense that we should empathize with their goals and motivations…then it’s not working so far. Uraraka is the main heroine, but she surprisingly hasn’t gotten to do much yet. She’s a nice enough character and she went out of her way to save Deku from what could have been a very embarrassing entrance into the school. She can be rather oblivious and unfortunately her power is one of the worst in the series, but at least she’s a good friend to have around. I am hoping that she gets a power up at some point though. 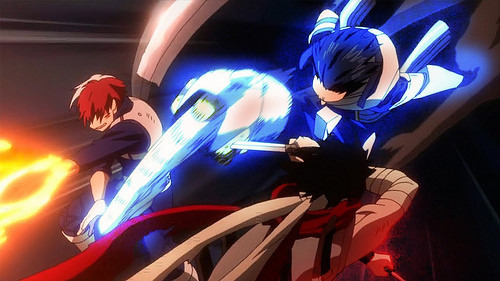 Iida is another one of the supporting characters. He’ll get a major role in the second season (or 3rd) so stay tuned for that. He’s a good character at the moment. Iida’s an ultra “Follow the rules” kind of character, but he pulls off the role well. Abandoning the others to go and get reinforcements was a bit risky though. I’m not saying that it was totally the wrong call, but this is where you separate the champs from the supporting characters. True, getting reinforcements is good to secure a win, but you’ll likely lose some friends along the way. Staying can be dangerous, but then you’ll all live or die together. I think a true hero has got to stay and if anything, act as a decoy or a sacrifice to let the others get away. I think that would have been the right move here. 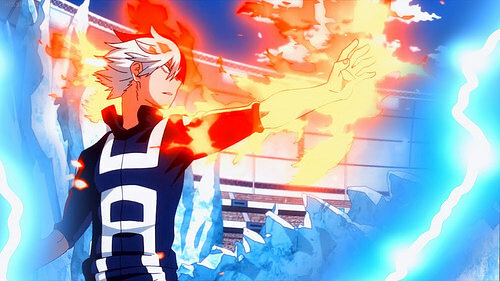 Todoroki is another rival for Deku and he’s my favorite character in the series. He hasn’t done much yet, but he’s the strongest student at the school (Aside from Deku) and he has a very cool and calm demeanor. He’s the kind of character who would really stand out in just about any show and you can never have too many rivals. His personality will get heavily nerfed in the future so enjoy him while you can. Having elemental powers is always really handy as well since what you can do is really only limited by your imagination. Another student who is around is Asui. She’s also not much of a fighter, but she gives Deku a lot of support at well and is really good in that kind of role. Her frog-like athletics allow her to cross large areas with a large bound so she can get teammates out of harm’s way. There are a lot of students and it’s going to take a while for the show to really introduce them all. I suppose that more of them will show up in season 2, but in the manga some of them never got to really do anything. That’s the problem with such a large cast, but at least it means that every supporting character is actually a real character and not just a nameless individual. The others are good so far and they’ll make for a decent supporting cast. It’s hard to say where they stack up against Naruto’s. One day I’ll have to compare them more. The only bad one is Mineta, but man….he is a terrible character. He’s the one bad aspect of the show. The show really has virtually no fanservice, but Mineta always has to have the sketchy lines and his running gag of going after the female characters to grab them is just unnecessary and terrible. Even if the characters try drowning him afterwards, it’s a little too late and the problem is that none of the characters seem to even care. I hope he’s written out of the show at some point. As with the students, there are a lot of pro heroes, but most of them haven’t done much yet. All Might is the main hero of course and while he is a homage to Superman, he’s not quite as transparent. As he appears more and more, you get glimpses into the fact that he has to keep a lot of secrets from the rest of the world. He believes that he is a symbol of peace to he has to seem invincible so villains won’t try to make a move. I can understand the logic, but people are going to find out about his weakness so he needs to tell more of the heroes as soon as possible or they’re going to be in a lot of danger. I also think All Might could have let the other heroes help out a bit more. 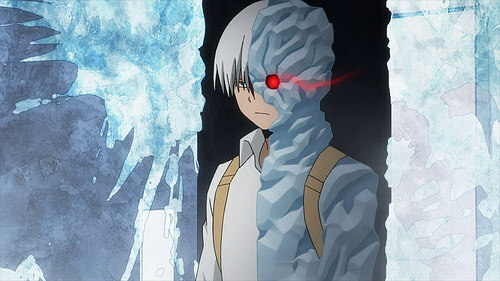 Surely Todoroki would have been some help against Noumu. He did save All Might after all and the fact that his abilities are long range means that it’ll be tougher for the villains to hit him. 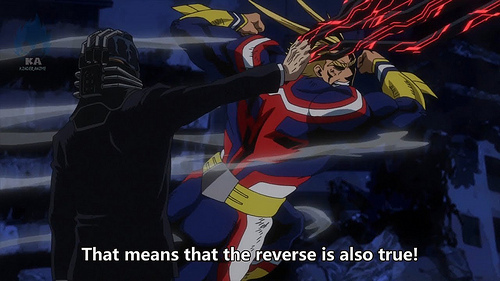 From All Might’s point of view though, he made the right call. No need to put the others in danger, but I would have liked to have seen the kids defy him more. Aizawa is the other hero to get a big role. He’s a cool enough hero and basically plays the Kakashi role here. He’s very strict and pushes the students to their limits. He’s also a fairly good fighter although his powers are really only good for one on one fights. The fact that he can nullify powers means that he can potentially take down some of the strongest villains in the series, but unless he can improve his physical abilities, he’ll inevitably hit a wall when the foes become faster and stronger than mortal levels. We already see that here to an extent, although most villains won’t be quite as strong as Noumu. The principal also appears and I like to think that he’s the spy within the hero ranks. I don’t like him so that’d be a double bonus. Shigaraki is the figurehead of the villains. We don’t know much about him yet, but he wants to destroy All Might and bring the world to chaos. His ability to destroy whatever he touches is certainly very dangerous. It’s not instantaneous, but it will cause severe damage. His ability is a good counter to Deku since he just needs one good hit to make up for the fact that he would die to a single hit as well. He nearly defeats Deku several times and they’ll definitely meet up more soon. His costume involves multiple hands grabbing him, which is a little odd. He’s definitely a strange villain and not quite as interesting as his partner, but he’s not bad. At least he can fight, which is a good start. Kurogiri is Shigaraki’s partner and definitely a cooler villain. His shadows ability is actually very overpowered and makes him one of the most dangerous threats in the series. He can appear just about anywhere at any time and the only place where you can hit him is his neck. I’m still a little skeptical on how the heroes missed him the first time if there is a real guy underneath the shadows so I’m going to assume that there’s another trick to his powers. (Or plot hax) He has a very intimidating voice and he’s the main reason why the villain’s plan could work at all. He may not be the leader, but he’s very deadly. Noumu is a mindless monster with a lot of attack power and durability. This makes him a good match-up for All Might. The design is okay, but it would score more cool points if the brain wasn’t always showing. He’s good as an opponent and isn’t a bad villain. He’s clearly not as interesting as some of the others, but he’s fast, strong, and nimble. He doesn’t suffer from the strong, but slow curse and I wouldn’t mind seeing him again. The show has a good character cast and that definitely goes a long way. The actual universe isn’t quite as interesting as other titles since there isn’t much to explore or other areas to be interested in. As far as we know, it’s just a pretty happy world with heroes. To make up for that, it was essential that there were a lot of likable characters, solid animation, and just good all around writing. 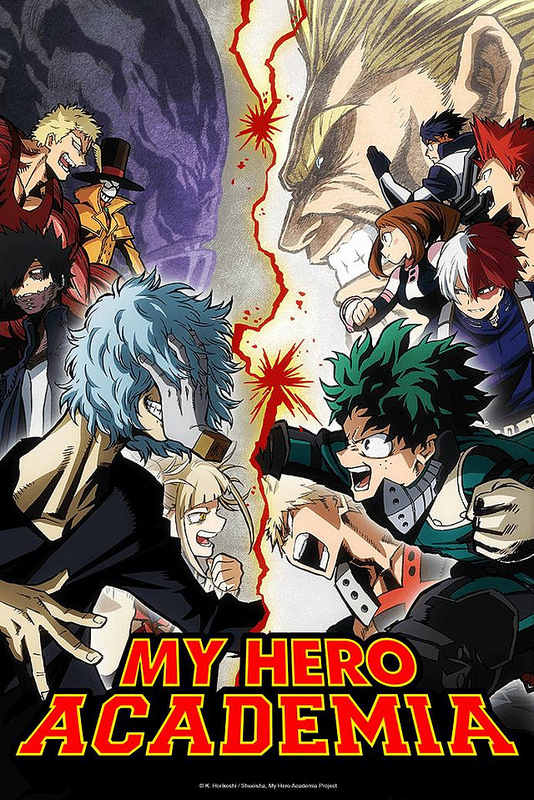 Luckily, My Hero Academia does all of this well and the big fight at the end was a nice, epic way to wrap up season 1. Hopefully the series can continue to go on for a long time so one day it’ll be long enough to actually have us compare it to flagship titles like Naruto and Bleach. It’s a solid start to the next generation and it just needs to keep up the momentum. Overall, I definitely recommend this show. It has a lot of action and likable characters. The producers, writers, and staff involved definitely put a lot of effort into the show. The 13 episodes will fly by before you know it, but luckily season 2 is already on the way. It’s definitely going to be an exciting sequel and the OVA that came out also looks really great. I don’t believe that they ever fix Deku’s costume either, which is good since I much prefer the blue suit that he ended up using for most of the series anyway. This is one mainstream, popular anime that really lived up to the hype. Between this, One Punch Man, and Madoka, that helps to counter Sword Art Online and Attack on Titan. I’ll be reviewing another super hyped show soon so we’ll see if I can say the same about that one. It’s been a while, but it’s time for the next Blog Event. This team battle will feature characters from One Punch Man and My Hero Academia in 8 1 vs 1 fights. We’ll see which Superhero adaption really has the stronger fighters! I shall have a review for this series when it is finished. It’s off to a decent start and I can easily see this series going on for a long time. It just needs to focus on the action and the concept while not being bogged down by other elements. Hopefully it goes well! This is a little spinoff to the main series. It very lightly retells the story’s events as a 4 koma comedy title. As with most titles of this kind of series, the jokes can get old rather quickly so there isn’t much of a future for it. It’s not all that bad though, but there isn’t much of a reason to read it. I’ll review the series when I finish it. I’ve finally started one of the new big hits. This series definitely looks like it’ll be a fun one even if one of the plot twists shouldn’t have happened. The fire/ice kid is definitely the best character so far so we’ll see if he can hold this place for the entire series or if he will be surpassed. I’ll have a review for the title when it is all done.